Four Immaculate High School student-athletes recently signed to play sports in the Fall of 2019 at Columbia University, Stevens Institute of Technology, Quinnipiac University and Mount Saint Mary’s University. “This is a very exciting time for these young student-athletes. Years of hard work have led to this special moment of deserved recognition of their ability to achieve exponentially in their academic studies and athletic prowess. We wish each of them continued success as they pursue their dreams,” said Mary Maloney, President of Immaculate High School. Angela Saidman of Bethel will continue running cross country and track and field at Columbia University, where she plans to major in economics. Angela, a distinguished honors student, has run varsity cross country and outdoor track all four years at Immaculate. After playing varsity basketball her freshman and sophomore years, she began running indoor track as well. While on these teams Angela won many awards and accolades, including being part of the cross country teams that won the 2018 Southwest Conference (SWC) Championship and Class State Championship four times in a row, from 2015-2018; individually she was a SWC champion twice, a three-time individual State champion, and three-time All-New England honoree. For outdoor track, Angela was State champion of the 1600m in 2018 and a New Balance Nationals participant in the distance medley relay (DMR). During the 2018 indoor track season, she also ran at New Balance Nationals in the DMR, was the SWC champion for the 3200m, was a State champion in the 1600m and 3200m, and was All New-England for her mile run. Besides her impressive athletic achievements, Angela received the Ronald Reagan Student Leadership Award, the President’s Award for Educational Excellence and the Holy Cross Book Prize. She is president of IHS’ National Honor Society as well as a member of the IHS Math National Honor Society and Science National Honor Society, and is the editor-in-chief of the IHS school newspaper. Mackenzy Garden of Danbury will play field hockey for the Stevens Institute of Technology, where she will major in biomedical engineering. At IHS, Mackenzy played almost every position on the field hockey field and was a captain this past season; she is also on the school’s golf team and will be a captain this season. In her junior and senior years Mackenzy was named to the All-Patriot Division team for field hockey; she has also been named to the CHSCA Junior Select team and named the team’s Most Improved Player, also for field hockey. She helped lead her IHS field hockey teams to the 2017 SWC and the 2018 Class S State championship titles. Mackenzy was also named a Nike Field Hockey Player of the Week and a WestConn Prepare for Preseason All-Star player during summer programs. A Distinguished Honors student, Mackenzy received the Rensselaer Polytechnic Institute Medal and was invited to the Columbia University Engineering Women’s Forum. She is a member of IHS’ Math Honors Society, Science Honors Society and National Honors Society. Mackenzie also participates in Campus Ministry, Key Club and the Rosary Club. Additionally, Mackenzy is member of Immaculate’s Brave Engineers team which just won the state-level Real Word Design Competition (RWDC) and will compete with her team in the national contest in April. Kayla Mingachos of Danbury, a soccer All-American, will play soccer at Quinnipiac University and is still determining her major. Kayla plaid center midfield and was captain her senior year for the IHS girls soccer team. Her list of accolades and honors is impressive, most notably that she was selected to the prestigious 2018 Fall High School Girls All-America Team by United Soccer Coaches. Kayla is one of only 58 girls in the country to receive this honor this past season. United Soccer Coaches is the world’s largest soccer coaches organization. Kayla was also named an All-New England and All-State First Team player for girls soccer. Kayla lead her team to the SWC Championship title in 2017 (for their fifth title win) with a record of 19-1 and the Class M State Championship in 2016, and was an integral part of the Immaculate girls soccer team that ended their 2018 season 12-3-1 with an appearance in the SWC finals and the State Championship tournament, where they were runner-ups. She was named to the First Team-All SWC and named All-State and All-New england in 2017 and 2018. Kayla is also a member of the IHS National Honors Society and participates in Campus Ministry. Spencer Brown of New Milford will participate in the school’s track and field program, including the long and high jump, at Mount Saint Mary’s University in Maryland where he will major in special and elementary education. Spencer is an important member of the IHS outdoor track and field team all four years at Immaculate, where he is a jumper and a sprinter and captain senior year and broke school records for the long jump and the high jump as well as the distance medley run for outdoor runs. He also ran indoor track 10th through 12th grades. Spencer’s talents helped the indoor track team win the SWC and Class S State Championships in 2016 and 2017 respectively. Spencer was named an All-SWC athlete three times, a team MVP, an All-State athlete, a Top 100 U.S. long jumper and high jumper by Milesplit, and qualified at the New Balance Nationals. He is still competing in this year’s indoor track season and soon outdoor track and field. A High Honors student all four years at IHS, Spencer also participates in the Culinary Club, Model UN, the Special Friends Club, the Chess Club, the Pottery Club, the Yearbook Club and the Film and Animation Club. 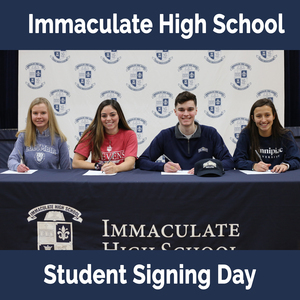 “Immaculate High School has always had a strong athletic program, with many of our teams winning SWC and State Championships, and it is possible because of the commitment, talents and hard work of our student-athletes like the ones signing to play in college today,” said Dr. Patrick D. Higgins, Principal. “In the past 10 months, Immaculate has won four State Championships including our girls field hockey team, girls cross country team, boys cross country team and our boys basketball team, and we have been ranked #2 out of 176 CT schools for Fall 2018 sports teams by Vantage SportsNet based on success in the CIAC tournaments,” he added. Immaculate High School, ranked by Niche as a top ten best private college-prep high school in Fairfield County, has the highest student SAT scores in the Diocese of Bridgeport schools. In addition to a college-preparatory academic program that offers over 33 Advanced Placement classes and a STEAM curriculum featuring advanced technology, a CISCO certification program, renovated science labs and engineering classes, Immaculate High School has an award-winning Fine Arts program, a student career internship program, athletic teams that have won SWC and State Championships, 44 clubs and a community service and Campus Ministry program that instills faith, compassion and reverence for others. Community service is also stressed; in 2018 students performed 27,794 hours of community service. In the 2019-20 school year, Immaculate will be offering additional business courses as well as a Certified Nursing Associate program.